When I was growing up, my grandmother used to host a classical music concert at her house every year. When I was 12 or 13 and much more into Bewitched or The Beatles or (as is evidenced by my love of this book) Broadway show tunes than classical music, I remember asking my mom if she really liked the concert. She told me that she liked going not because of the music, but because of how great it was to watch talented people having fun doing what they love. Now I loved Will Grayson, Will Grayson, by John Green and David Levithan. And I Loved (note the capital L) Tiny Cooper. 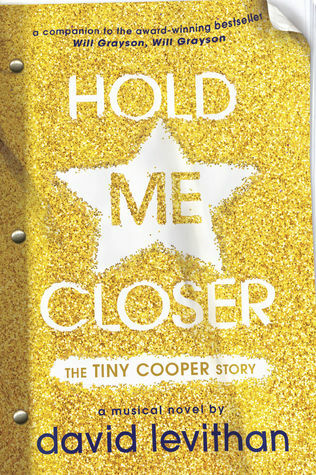 But the best part of reading Hold Me Closer: The Tiny Copper Story was reading words that felt like the author had an incredible amount of fun writing. You definitely don’t have to have read Will Grayson, Will Grayson to read this companion, musical novel, but if you have you will know that a large portion of the book’s plot centers around Tiny Copper writing, directing, and starring in a musical play about himself. Hold Me Closer is that play. Song lyrics, monologues, stage directions and all. I will say that while I was excited to get my hands on this book – and even more excited to see David Levithan perform scenes from it with various author friends last week at The NYC Teen Author Festival – part of me did think that it might be kind of gimmicky. I was pleasantly surprised to find that the book had a lot of meaning, emotion, and story arc along with the clever references (from Harry Potter to High School Musical to Follies) and very very funny lines I expected. A lot of this meaning/emotion is achieved through the stage directions, which often give insight to Tiny’s feelings or motivations during the important scenes of his life. Of particular charm were the opening number (Tiny’s birth obvi) and the parade of Tiny’s 17 ex boyfriends. I’m sure others will have different favorites, because there are definitely many to choose from. I definitely recommend this book not only to fans of WG, WG, but also to theater geeks, Broadway lovers, and any reader looking for a quick and fabulous read. As for myself, I am crossing my fingers that an audio book version comes out soon. This entry was posted in Book Reviews and tagged books, David Levithan, HOld Me Closer, Hold Me Closer the Tiny Cooper Story, Will Grayson Will Grayson, YA by Alison Doherty. Bookmark the permalink. Such a great review – can’t wait to get my hands on this! Book club discussion to follow via skype for sure. I can’t believe you got to see David Levithan act out scenes – that’s amazing. We should do dramatic readings of it via skype! Can’t wait for you to read it! Oh, man. I wish I could’ve seen that dramatic reading. That’s so awesome. I loved this one too!